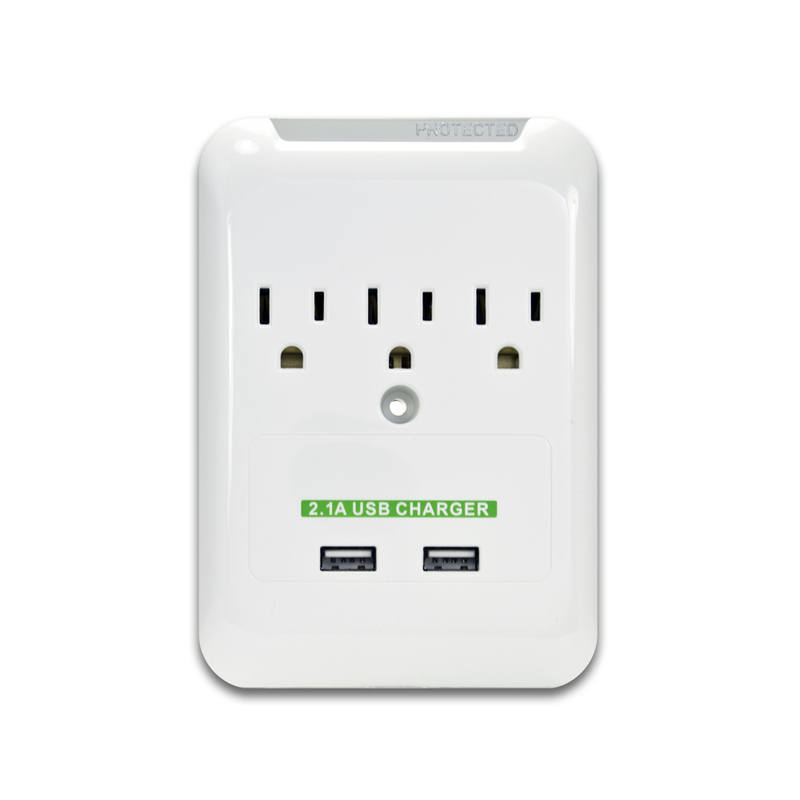 This wall charger fits over your existing power wall plate and supplies 3 surge protected power outlets and 2 USB charging ports. 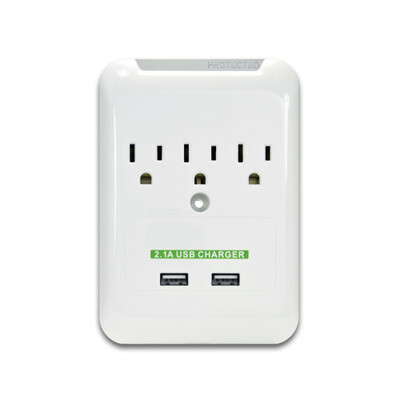 The USB ports provide a shared 2.1 amp max so they are capable of charging tablets and phones. High quality, attractive and very useful. Also serves as a night light. I really like this one, came with a mounting screw that permanently mounts the outlet to the existing outlet for a very tight connection. Use it a few times. Good charging! Better than using your computer for charging! Item was as advertised. Really cleans up our charging area. I would highly recommend this product based on quality & price. Very convenient way to charge devices without having to plug into the wall socket only. Appear to be well made. I purchased two, one to use and one for a gift. VRB (Renton WA) This is a great product. I haven't found one fault while using it. The green light is really cool. I have bought several products from CableWholesale and I have never been dissatisfied. I liked this product quite a bit at first. After a while the green light stopped working. Additionally a couple weeks ago I experienced circuit problem at the outlet where this device was plugged in. The device and my outlet both were badly burned. Fortunately the device while sustaining considerable burn damage did not catch fire. Unfortunately the device covered my outlet so when the problem began to occur I did not know until both my device and the outlet were both destroyed. I actually liked the device quite a bit until the green light failed. For me it made a good night light as I kept it in my bathroom. Will I purchase another now that my first one is destroyed? I don't think so. I became fairly disapponted when the green light quit and some of my devices would not charge with the USB. Quality item. Charges fast. My only complaint is how bright the green light is. However, i'm very satisfied with this outlet usb charger. Items shipped & received exactly as described & promised. Size a little larger than expected, green light annoying and too bright, three plugs too close together when using AC adapter. I was looking for a USB/AC wall combo and this is it! Great look at a very reasonable price! The product is everything we expected it to be. However, there is a green light at the top which glows too bright at night. We have had to cover the light with black tape. I really like this product. It works well. I am very pleased that it gives me an additional outlet as well as the usb ports. According to the box the usb ports total 2.1 amps. This leaves me to believe that they are not 2.1 amps each. The description says "The USB ports are 2.1 amp ". I wanted to be able to fast charge two devices. Appears to be well built. AC outlets are close to each other so block-type plugs take up room...but this was to be expected from looking at the picture of the product...otherwise, great product! Exceeded expectations but was clearly and accurately depicted and portrayed. The 2.1 Amp USB plugins work extremely well with my wife's Kindle Fire HD. The Amazon charger is 1.9 amps and cost almost double what this item did. This item INCLUDED 3 110V taps as well as 2 USB charging ports. Extremely well thought out and with all this it's also a Surge Protector, too! Great product. Well built and not a Chinese knockoff. Where we struggled with charging I-stuff only one or two at a time from this convenient outlet, then switching around for other usage, this wall tap allows us to charge anything via a USB port as well as allowing regular plugs to be used. In all, it really is a great thing having 3 converted outlets from 2, PLUS 2 usb charging ports. Great Product!! !